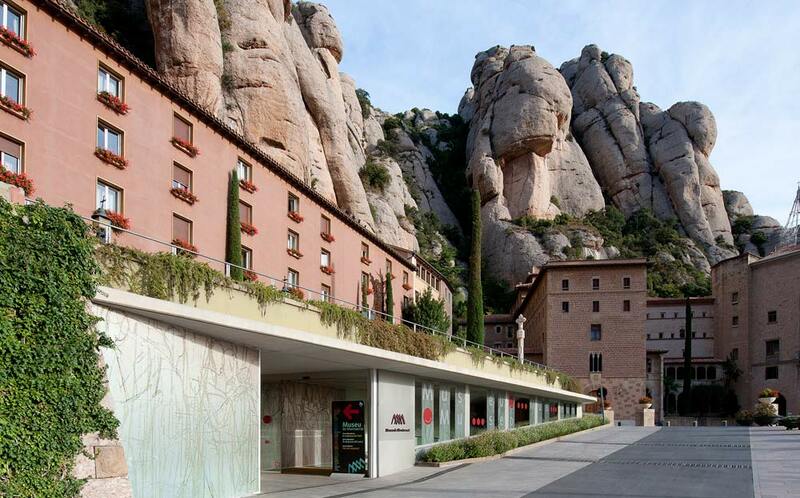 Sala Daura in Museu de Montserrat (MDM) houses, from April 20th to October 7th, the exhibition Mirrors of Stone, by Enrique Asensi. The 25-work exhibition –some of them unpublished, small and big size sculptures- seeks to offer a closer look at Asensi’s geometric abstraction. It displays a selection of his indoor works, sheltered by the imposing beams and girders of Josep Puig i Cadafalch supporting the ceiling. As Berger argues, “art does not help explain the mysterious. What art does is make it easier for us to notice it. Art reveals the mysterious. And when it is perceived and discovered, it becomes even more mysterious.” This is Asensi in his purest form. His suggestion goes beyond the space itself, that of Pere Daura MDM’s exhibition hall; it suggests an emotional state that transcends the present and projects itself, enigmatically, towards the future. A significant part of his sculptural work is left to chance, at the hands of the inclement weather; it rusts and erodes, surrendering completely to the inexorable passing of the seasons. It is little wonder that the creator, who fills his vocabulary with Germanic words, refers to the idea of ​​zeitlos (timeless) to embrace agelessness. Asensi usually works with corten iron, a material with brownish shades. However, in the quarry he chooses the pieces with the different pigmentations in mind. The result is an increasingly refined sculpture, whereby the artist dispenses with anything superfluous and focuses on simple and clear forms in order to reach the essentials. ‘He immerses himself in the materials, understands them and is able to treat, cut, burn and polish them, seeking a balance and harmony between the minerals and the metals. It is a laborious and expensive process. Some slabs can be converted, with varying use of his chisel, into what he himself calls mural sculptures. Often combined with steel and supported against the wall, they become suggestive pictorial sculptures, works that stand firmly on the ground, as if they had always been there. It is easy for the general public to form associations with doors or gateways inviting them to enter unknown territories,’ explains Aina Mercader. By applying hot wax to wood, the sculptor creates paintings which, crafted by fire, a chisel, an axe and knives, draw closer to sculpture. Works conserving their autonomy which, however, on occasions turn out to be annotations in red (or white) on black for potential monuments. Conditioned by the spontaneity of the materials, he rapidly seeks to sketch specific figures between the lines. The small sculptures, preferably made of alabaster and iron and presented in groups on custom-built tables, also function as initial designs or sketches. On other occasions they are nothing more than a few scribbles on a scrap of paper. On these sheets the artist visualises outlines which flee from pre-established geometries and indicates measurements and weights, bearing in mind the image to be created, the one he wishes the spectator to retain, in which they look like mirrors of stone, bursting with existentialist approaches beyond the here and now. “All true art addresses something eloquent which, however, we are unable to understand. Eloquent, because it touches on something fundamental. How do we know that? We don’t know. We simply acknowledge it.” I repeat this quotation by John Berger, taken from his book entitled Berger On Drawing, after my first visit to Can Maginet, where Enrique Asensi’s impressive Sculpture Park is on display. Huge bulks of stone and iron sprout up among the vines surrounding the artist’s house-workshop. They are striking pieces, built like totems, reminiscent of colossal structures such as menhirs and ziggurats. ‘In some cases, the cracks in the stone or iron, small openings like embrasures, transform the sculptures into doors and windows framing or highlighting certain parts of the landscape, in alignment with the horizon, with a path or letting a beam of light through them; the most hermetic go as far as mimicking their surroundings or act almost like reverberant mirrors, imposing shadows and games of concealment.’ as the exhibition’s curator recalls. Enrique Asensi (Valencia, 1950) was educated at the San Carlos Academy of Fine Arts in Valencia. In 1977 he moved to Germany, where he discovered abstract sculpture. He has pursued most of his career in this country. His work occupies public spaces in various cities and towns throughout Europe. In addition, his work has been exhibited on an individual and collective basis at galleries and art centres in Germany and Spain. He divides his time between Cologne and Les Gunyoles (Avinyonet del Penedès, Barcelona).